The Philadelphia Inquirer’s Chris Mondics, who helped bring to light the promises President Obama made to 9/11 family members to declassify the 28-page finding on foreign government involvement in the 9/11 attacks, has a new story today that focuses on the latest filing by Philly law firm Cozen O’Connor, which is suing the government of Saudi Arabia on behalf of victims, survivors, families and insurers. The heart of the new filing, essentially an amended complaint reflecting Saudi Arabia’s reinstatement, is the argument that the Saudi royal family, in a bid to retain power, ceded ever greater authority to radical clerics in the early 1980s. That strategy followed an armed revolt by religious fanatics who briefly took over the Grand Mosque in Mecca, the holiest site in Islam. The attack made clear that the royal family was on thin ice. To compensate, the family gave fundamentalists broad access to government ministries, Islamist charities, and diplomatic missions, enabling them to spread a virulent form of Islam. Bayoumi claimed after the World Trade Center attacks that his meeting the hijackers was coincidental. But it is one of a chain of events that appear too improbable to be random. The key facts unfold on the morning of Feb. 1, 2000, when Bayoumi says he traveled from his home in San Diego to the Saudi consulate in Los Angeles to meet with an official of the Saudi Ministry of Islamic Affairs named Fahad al-Thumairy. A few hours later, Bayoumi claims to have met Hazmi and Mihdhar by chance at a nearby Middle Eastern restaurant. Three days later, Bayoumi offered to resettle Hazmi and Mihdhar in San Diego, where he helped them find an apartment and open a bank account. That same day, Bayoumi made four phone calls to Anwar al-Awlaki, an al-Qaeda recruiter and operative, whose radical preaching had served as inspiration for Maj. Nidal Malik Hasan, the Fort Hood shooter, according to an FBI memorandum acquired by the Cozen firm. Lead Cozen litigator Sean Carter told Mondics, “Just as a matter of coincidence, you would have less of a chance running into that many people with links to terrorism in Afghanistan on Sept. 10, 2001.” Read the entire story here. 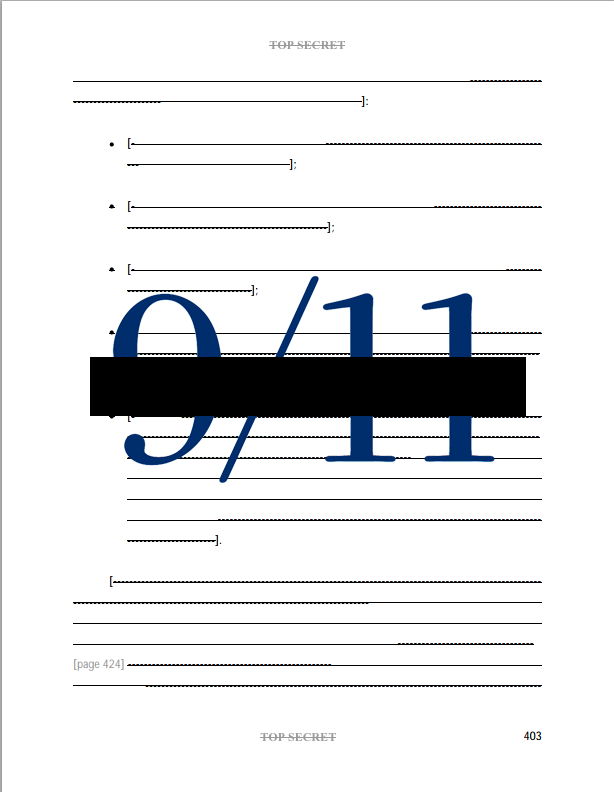 Have your representative and senators read the 28-page finding on foreign government support of the 9/11 hijackers—or are they part of a mass dereliction of duty on Capitol Hill? There is no doubt in my mind that Saudis are behind the 911, and all the conflicts in the middle east. I spend 2 years in the Refugee camps in Rafha after the Desert storm and I learned so many horrible things about them and their mentality . I personally can not believe our Gov. is supporting them with all what they have done and keep doing. I feel they live in the past and we are accepting the horrible things they do everyday. Change them before it is too late.